MIYB. Sophie, we’re so looking forward to hearing you speak next month! What inspired you to start your business and how did you come up with your business idea? SP. Thank you! Well we couldn’t find a job in the creative industries in Wales! We were facing either moving to London for work, or creating something for ourselves, so that’s what we did! MIYB. Amazing! So what does a good day on the job look like to you and what’s the best part about owning your own business? SP. The more productive we are, the better we feel! So when we can be in the office for a full day pushing the business forward and working on fresh ideas and motivating the team then that’s the best day for us. The best part about owning our own business is getting to work together all the time. We really are best friends as well as business partners and sisters, so that is also the highlight! MIYB. What are the biggest challenges you face as a business owner and how do you overcome them? SP. Our biggest challenge at the moment is managing our growth and forecasting. Every day, week and month are completely different, so future planning is really important for us to continue to grow but that is the most difficult part to manage. SP. Creating our successful campaign with Paramount Pictures! MIYB. That sounds incredible! I can’t wait to hear about that at the event. 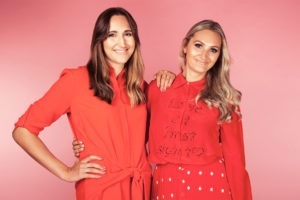 You’ve created such a reputable brand in such a short space of time so what is the one piece of advice you’d give to any aspiring female entrepreneur? SP. I’d say, focus on every positive – no matter how small – and that will help you push through the setbacks. MIYB. Absolutely! Last questions then, what are you most looking forward to about the MIYB event on April 27th in Cardiff? SP. Meeting fellow girl bosses of course!! If you want to join Sophie, her sister Hannah and fellow, local female entrepreneurs for an evening of honest discussion about what it takes to set up a business in the area and down-to-earth networking with like-minded women, join us at Make It Your Business at Tramshed, Cardiff on April 27th. Tickets £10.